The Princess named this braid the arrow braid because of the way the strands diagonally slant in towards the middle, forming tiny arrow points all the way down the braid! Some of you may have noticed her hairstyle in our room tour video. This is actually the same braid she was wearing that day, just finished in a different way. During the room tour, she had an arrow braid on one side, connected at the back with a regular braid on the other side, with her hair mostly down. 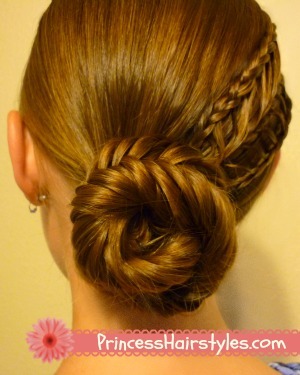 Of course, the styles you could create using this braid are endless! As you can see in our video tutorial today, we opted for the braid on one side, ending in a fishtail braid bun. I'm loving the combination of the fishtail and arrow braids together, as the arrow braid looks kind of "fishtaily" to me anyway, so they seem to go together nicely! I know a lot of you struggle with french braiding. 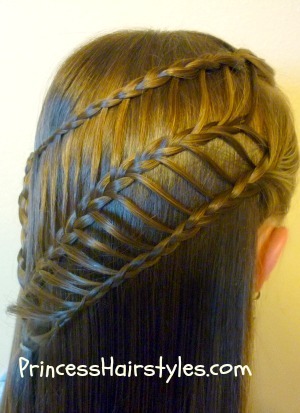 So, I have tried to keep this braid fairly simple by using regular 3 strand feather braids. Of course if you wanted to, you could use french braids, waterfall braids, or lace braids with this same basic concept for a slightly different look. 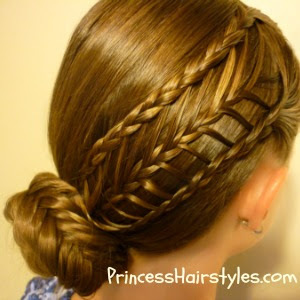 Arrow Braid With Fishtail Bun Video Tutorial: Click here to watch directly on YouTube. Another hairstyle idea: In the pictures below, we made an arrow braid on one side and braided the ends into a regular 3 strand braid on the other side. If you lace braid the top section, it will hold its shape without having to connect the braid to something on the other side. 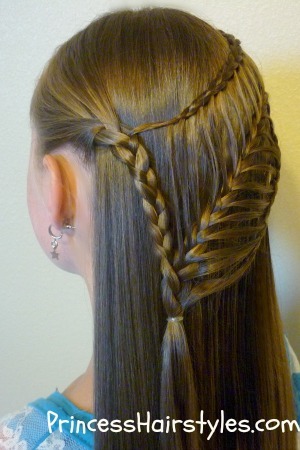 If you like wearing your hair down, I think it would look very pretty to create a diagonal lace arrow braid all the way across the back of her head! And one more idea (since Independence Day for the U.S. is right around the corner.) A patriotic 4th Of July Hairstyle! For this look, we just wove some red, white, and blue ribbons through the strands of the arrow braid and tied a bow with the ribbons at the bottom. So fun! I think this would be so cute with the lace braids down the sides and the feathers making a braid down the middle....not sure how you'd finish it off though. 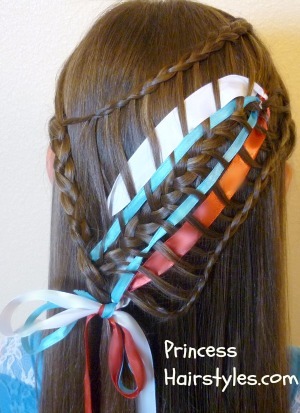 It might look silly with the end of the middle braid just hanging down in the middle of the outside braids. Unless you pulled it all into one pony. My daughter just donated 10 inches to Locks of Love, so it's going to be awhile before I can try it out myself. Btw, what's the Princess reading? My daughter loves to read, and I'm pretty sure they're about the same age (10). Yep, they are the same age! She was reading "Wait Till Helen Comes." Wow! Thank you for the great tutorial. Will give this a try soon but it looks hard for a newbie like me. can this hairstyle be done in curly hair? I love the arrow braid designs. Can it be worn in special occasions and school?